Many people will have been inspired to take up running after watching the London Marathon this year. After all, running is one of the simplest and cheapest forms of exercise, requiring very little in the way of equipment or accessories. There are a few things to bear in mind before you lace up your shoes and head out to pound the pavements. 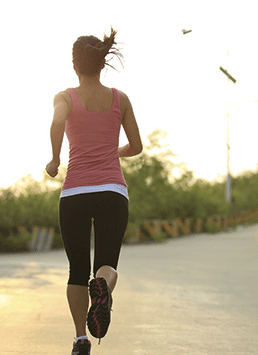 Here, celebrity and elite marathon runner Nell McAndrew, offers some tips for getting started. Start slowly: Many beginners make the mistake of going off too fast and then soon get puffed out and think they can’t carry on. You don’t need to sprint as fast as you can when you first head out the door; begin by doing a gentle jog at a pace at which you still have the breath to hold a conversation. Get the correct kit: Running will be a much more enjoyable experience if you feel comfortable – which means exercising in clothes and trainers designed for runners. Clothes should be lightweight and breathable. It’s advisable to visit a running shop so they can recommend the best shoe to suit your running style. Wearing a sports bra is also essential for women to eliminate any chest bouncing. Food is fuel: Eating well will help you run well as it will fuel your exercise. If you have a meal before running, make sure you eat at least two hours before to avoid a stitch. Before running it’s good to eat carbs like wholemeal bread and rice cakes, while afterwards eating protein like eggs, fish and nuts will help your muscles recover. Join a running club or group: You’ll never be short of people to run with if you join a club and attending once or twice a week will help you get into the habit of running regularly. They are the best places to get advice on how to improve and you can meet like-minded people who will support and motivate you. Clubs are open to all abilities so see what is available in your local area. Enter a race: It might sound scary when you’re starting out but entering a race will give you a goal to aim for and add focus to your training. It doesn’t have to be a marathon – opt for a 5k like a Race For Life or Parkrun and give yourself six to eight weeks to train for it. The sense of achievement you’ll get from finishing – and experiencing the buzz of the race atmosphere – will also motivate you to keep running. Nell McAndrew’s Guide To Running is on sale now, published by Bloomsbury. “The foundation to good running form is optimal posture at any given moment,” says Gray Caws, director of Chi Running UK (www.chirunning.uk). “Practise standing posture then bring this into your movement whilst walking and running. Good postural alignment, balanced with just the right amount of relaxation (such as relaxing those tense shoulders) allows us to take control of our bodies when moving. Running (and walking) out of alignment with too much muscular tension puts unnecessary stress and strain on joints, creates fatigue and discomfort, and often leads to pain and injury. “A mistake I often see, not just with beginners but seasoned runners also, is doing too much too soon. A beginner soon sees a big improvement aerobically. They feel fitter so want to do more but the body may not be ready for this. It takes time to condition the body (and mind) to cope with the additional stresses and strain. Consider also that if we are out of alignment to start with, these additional stresses and strains will only compound a poor movement pattern. Think about the principle of gradual progress – it’s the simplest free advice anyone can get but often the most difficult to take on board. You’ll feel inspired and want to ‘push’ yourself but take things slowly and build gradually. First work on technique then increase distance then allow speed to ‘happen’ – to be a consequence of this process. 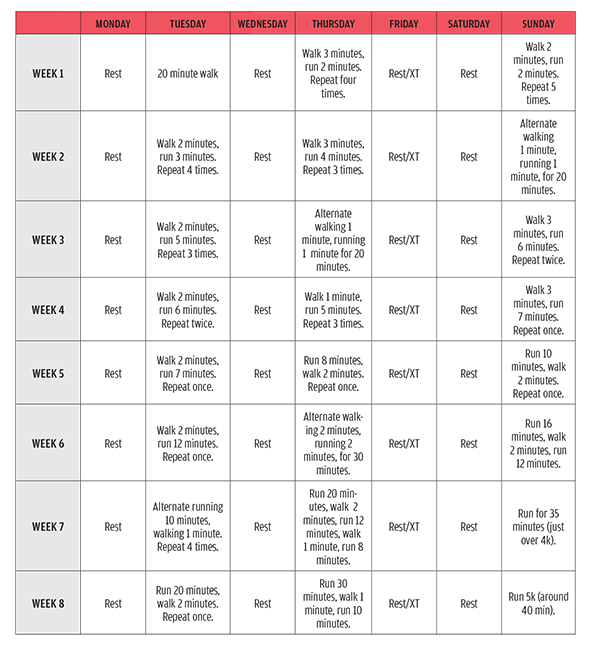 This complete beginners 0 to 5k running programme has been devised by Julia Buckley, fitness trainer and author of The Fat Burn Revolution (www.juliabuckley.co.uk). Always warm up before each session either with a few minutes of brisk walking, light aerobic moves or climbing the stairs a few times. - The programme consists of three training days per week, with your longest runs on Sundays, but they don’t have to be on the days listed if it doesn’t suit your schedule. However, it is wise to take a rest day between sessions. - Days marked ‘rest’ are set aside to allow your body time to recover and grow fitter and stronger as a result of your training. Fridays are marked Rest/XT, which means you can either take an additional rest day or do some cross training – this could be cycling, swimming, aerobics or working out in the gym. - Don’t worry if you can’t complete sessions from time to time, just take an extra rest day to allow your body to adjust to the additional exertion you’ve been putting it through. If you miss more than one session in a week you’ll simply need to repeat that whole week’s training before moving on to the next. - Stay positive! Running 5k might seem like an almost impossible distance at the start of the programme, but complete all the sessions and you absolutely will do it.